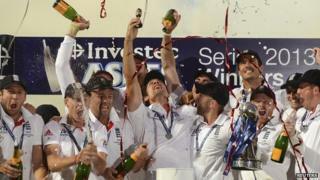 The England cricket team are celebrating winning the Ashes against Australia. Alistair Cook's side came away with a 3-0 victory. However, there was a feeling of disappointment among English cricket fans because they were denied the historic 4-0 win they all hoped for. Play was called off because of a bad light resulting in a draw in the final match. If England had have won the last game it would have been the first time they have had a straight victory on home turf. Captain Alistair Cook said he was frustrated at the decision but he understood that the umpires were just sticking to the laws of the game.